From Goodreads: 14-year-old Heath Lambert is spending his summer at Camp Harmony in the picturesque Cascade Mountain Valley. It’s the perfect place to enjoy the soothing calm of nature as he weighs a heavy decision. The camp offers distractions: his friends, Cricket and Dunbar, always up for trouble; his reluctant crush on Emily, one half of the beautiful Em & Em Twins; and hulking bullies Thumper and Floaties, who are determined to make him their punching bag for the summer. But no one rattles Heath like his creepy cabin mate, Will Stringer. Brilliant, cold and calculating, Will views the world as one big chess game, and he’s always three moves ahead of everyone else. Heath soon learns there’s a much bigger threat to contend with. Something’s wrong with the animals in the surrounding forest. A darkness is spreading, driving them mad with rage. Wolves, bears, mountain lions-even the chipmunks are infected, spurred on in droves by one horrific goal: hunt and kill every human they find. Heath and a ragtag band of campers are faced with a choice: follow Will’s lead and possibly survive, or follow the camp staff and die. But how do you trust a leader when you suspect he’s more dangerous than the animals you’re running from? Heath came to Camp Harmony to be surrounded by nature. He’s about to get his wish. What would happen if the land-dwelling animals of the world suddenly lost their fear/love of humans and began outright attacking us? 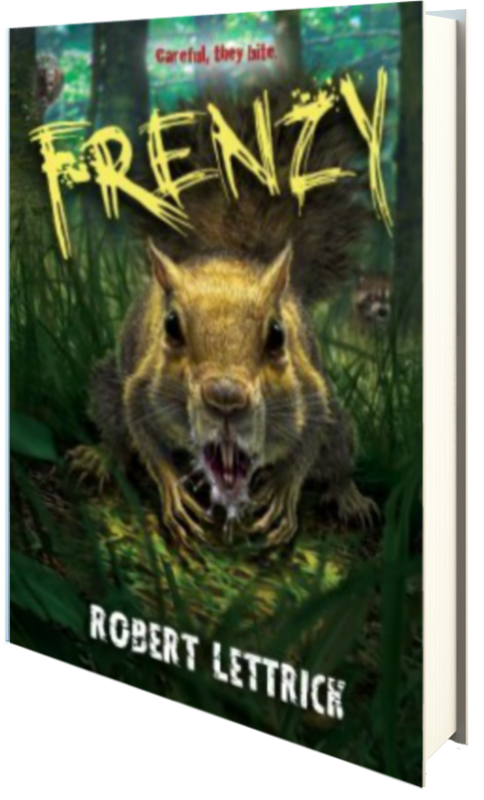 It would be like a zombie apocalypse, but with animals, which in my opinion, is even more scary… and that’s exactly what Lettrick pens in his exciting novel, Frenzy. With an airborne virus that spreads an altered version of rabies, animals of all shapes and sizes are infected, shedding their fears and lusting for blood–mainly, the blood of humans. Enter Heath, a young man who’s already staring death in the face due to a resurgence of cancer, and the prospects don’t look good. But at least he has this last summer pretending everything is okay. That is, until a brood of animals begins slaughtering his campmates. With the river as their only respite from the hoards of animals intent on obliterating their existence, Heath and his “friends,” Cricket, the Ems, Will, Dunbar, Miles, and a handful of others find themselves trapped and running out of options fast. This is a fast paced read that I highly enjoyed, and I think most MG and YA readers will feel the same. There is a lot of death within the novel–animals are quick, as it is, but even so, it’s a believable and enticing enough read–and thankfully it’s not too graphic. While there are a lot of characters, Lettrick makes it easy to tell them apart and their plights are believable. It’s awesome. Four stars. In exchange for an honest review, Disney-Hyperion has been extremely gracious in allowing me to read an ARC of this novel, via Netgalley, prior to its release on April 8, 2014.